A look inside the USA gymnastics sexual abuse scandal that shook the sports world in 2017 depicting a landscape in which women spend their youth seeking victory on a world stage, juxtaposed against a culture where abuse prevails and lives are damaged forever. At the Heart of Gold: Inside the USA Gymnastics Scandal is directed by Erin Lee Carr and will premiere on TBA. 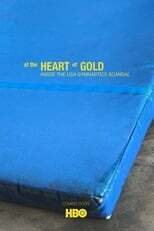 Director Erin Lee Carr's Documentary movie At the Heart of Gold: Inside the USA Gymnastics Scandal is produced by HBO & HBO Documentary Films & was released 2019-05-03.